This is an In Person signed 6" x 4" by the South African born actress who is the only surviving member of the Cast of On The Buses. 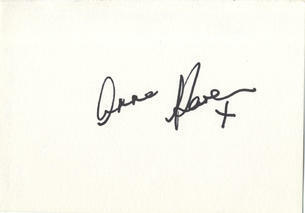 Anna Karen (born 19 September 1936) is a South African-born English film, television and theatre actress. Prominent in soap opera and comedy her best-known roles are in the sitcoms On the Buses and The Rag Trade. She has also made recurring appearances in soap opera EastEnders from 1996 on a recurring basis. Following the death of Stephen Lewis on 12 August 2015, Karen is the last surviving member of the main cast of On The Buses.